I have been sewing nearly all of my life and I have finally bought a serger. So I'm learning how to use a new machine. That's good for my brain, don't you think? My friends advised me to go with a Baby Lock serger, and to make sure and get one of the newer models with the automatic threading and the ability to do a cover stitch. So I sold some old diamond rings that were sitting in my safe, and splurged. Here is my new serger! 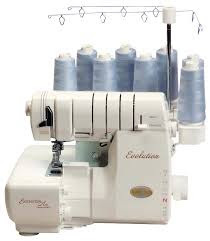 Its the Evolution, which can sew just about everything and hold eight spools of thread. So far, I've taken one beginning class and have watched a ton of YouTube videos. What did we ever do before YouTube. And a huge shout out to those of you that do videos! I dived right in and pegged an old pair of yoga pants (so that they're not the old fashioned bell bottoms), made two pairs of legging/pants, and have made two knit tops. I hope you enjoy learning new things too. Good for you to make some new clothes with your serger! Sergers can do all sorts of stitches. I've made a lot of swimsuits over the years with mine! Have fun learning even more about your new friend!